In this week's episode Dave, John and Kyle discuss a proposed game show sitcom (2:10), the possible overexposure of Carpool Karaoke (6:00), and The Bachelor Finale featuring Ben Higgins (12:30). 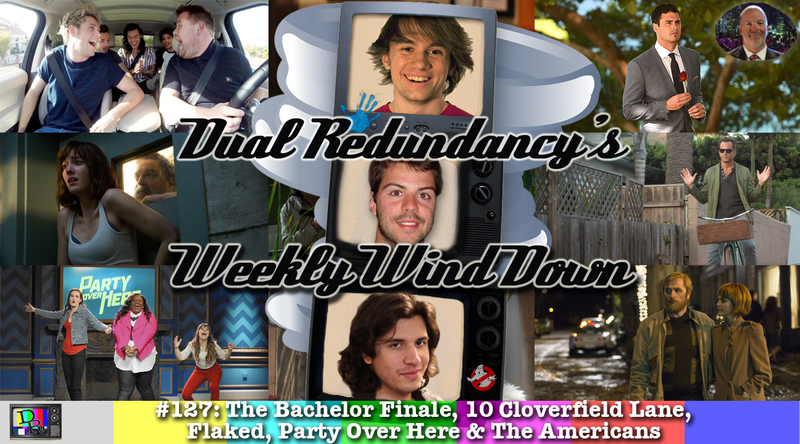 We also review 10 Cloverfield Lane (20:05) and the series premieres of Flaked (29:00) and Party Over Here (37:25). Finally, we review the season four premiere of The Americans entitled “Glanders” (48:20).